Cooking can be an intimidating skill to learn, and making nutritious, well-balanced meals every day can be time-consuming. Many of the families we serve work long hours to provide for their children and themselves, sometimes working two or three jobs to pay the bills, and they don’t always have enough time to cook. Ready-to-eat, canned, or frozen meals require less time, and they’re often cheaper than healthier items such as fresh produce or lean meat. What’s more, we often find that many people lack adequate nutrition education, and do not know how to discern the actual nutritional value of an item or how to easily turn fresh ingredients into a satisfying meal. As a leader in hunger relief we play a critical role in promoting the overall health of our communities. That’s why we offer nutrition education and access to healthy food resources to our partner agencies, empowering them to share their knowledge and skills and help their clients make healthier choices. 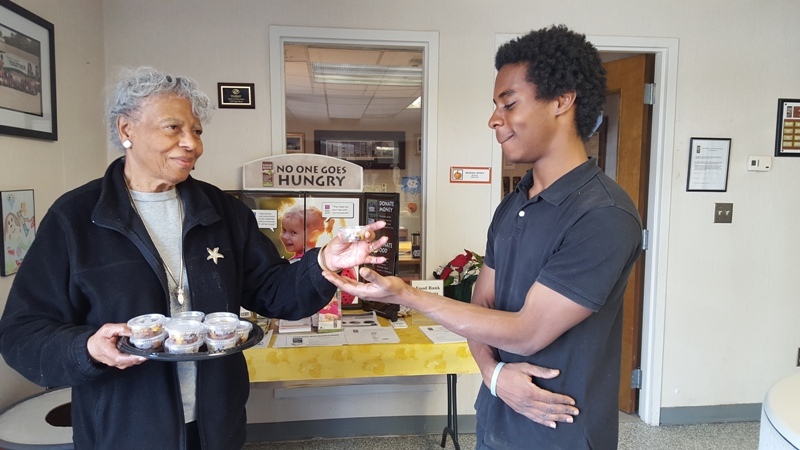 To celebrate National Nutrition Month, we’re offering samples of nutritious food items and healthy recipes to our partner agencies at our branch that highlight healthy snacks. We have all experienced the struggle of snacking, often times on food that is high in sugar, salt, or trans-fat. But healthy snacks can be a good thing, especially for children. Healthy snacks provide energy in the middle of the day or after exercising or play time. A healthy snack in between meals can also decrease hunger pangs, prevent overeating at mealtime, and help regulate blood sugar. Partners sample healthy snacks at our Sandhills Branch. The challenge of course is that chips are cheaper than fresh fruit and buying a package of pudding cups is faster than making applesauce at home. We also know that on a tight budget cooking requires more creativity as the chef must stretch relatively few ingredients and use them in many different ways. By demonstrating how to cook with versatile ingredients, we hope to show our partners how healthy items such as apple puree, peanut butter, popcorn, and fresh produce can be turned into quick, creative, and healthy snacks for their clients and their families. Check out our recipe below for a creative way to use sweet potatoes in salsa. We’ll be sharing this recipe and others all week long with our partners. Share it with your friends and family! Preheat oven to 400 degrees. Cut sweet potato into small chunks, put in bowl and sprinkle with seasonings and olive oil. Lay sweet potatoes on parchment lined tray. Cook from 15-20 minutes, until easily pierced with a fork. Turn halfway through. Add corn, black beans, onion, tomatoes, cilantro, lime juice and additional seasoning to a large bowl. Let sweet potato chunks cool for 10 minutes, and add them to the large bowl. Mix everything together, and serve with tortilla chips.